Staining is the most common technique to enhance visibility of your specimen. This is particularly true for transparent samples which has very little contrast between the object and the surroundings. The stains form stronger chemical binding to certainly types of components of the specimen then the background. This allows the structure of your interest stand out of the background. Microscopists usually obtain scientific grade stains from scientific reagent suppliers or microscope specialty stores. Do you know that you can make the microscopy staining solution by yourself instead of buying it from the specialty stores? Some of the ingredients are readily available in the regular stores, either locally or on-line. Methylene blue binds DNA which is very abundant in the nucleus. Cell stained by methylene blue will show the nucleus with deep blue color. The cytoplasm will show light blue color as it contains RNA which has slightly lower affinity with methylene blue. 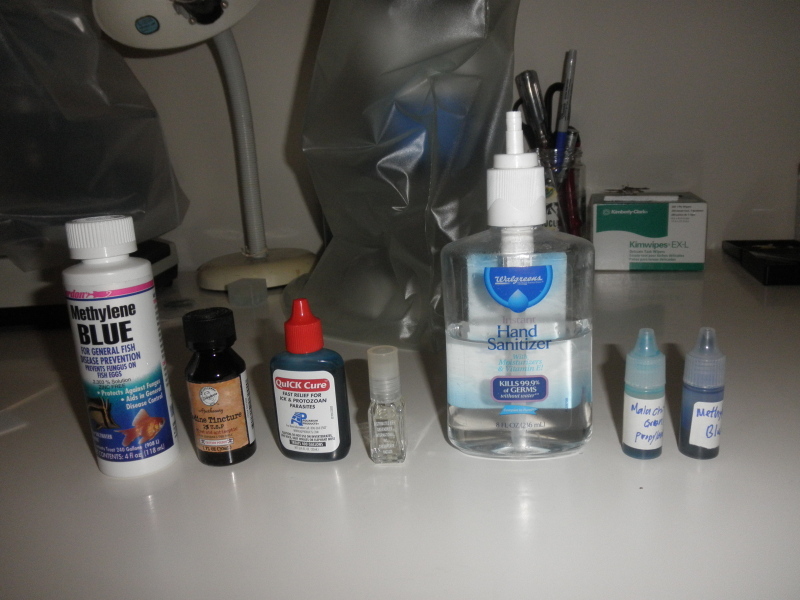 Methylene blue is used by aquarium hobbyist for preventing fungal disease. It can be purchased from pet store. The concentration for aquarium medication is usually 2.303 %. You will need to dilute it by add water at 1:1 ratio. This will be very close to the commercial methylene blue stain at 1%. Malachite Green can form weak binding to plant cell or spore wall. It is used for treating protozoan disease called ICK in fish. You can also obtain it from aquarium store. Depending on the solution you purchase, you may or may not need dilution. Iodine can react with starch to form purple color. The dense colors indicate area where the starch and glycogen concentration is the highest. Iodine can be purchased over the counter at pharmacies. Typical iodine solution for antiseptic is 2%, you will need to add one part of water for every part of iodine. In addition to the above medications, you can also use food colorants for staining. An interesting article at Microscopy-UK used some common food colorants for pond life staining, such as Fast Green FCF (Green #3), Brilliant Blue (Blue #1) and Tartrazine (Yellow #5). The article also used nail polisher as mountant for permanent mount. Another post at yahoo Amateur_Microscopy Group investigate four different common food colorants’ staining performance on cheek epithelial cells. The results showed acceptable general cytoplasm staining but perform poorly for nucleus staining. Including 12 plain slides, 2 concave slides, 100 cover slips, 25 pcs slide box, stains and pipets.